The new Family Lodge hotel building approved for Biltmore Avenue is shown here at center between the Wild Wing Cafe restaurant at left and a new luxury condominium building, which is currently under construction, at right. Asheville City Council voted 4-3 Tuesday night to approve a new 56-room hotel spread across three historic old homes that will be preserved and one new building, all located on Biltmore Avenue in downtown. Mayor Esther Manheimer, Councilwoman Julie Mayfield and Councilmen Keith Young and Vijay Kapoor voted in favor of the proposal by developer Al Sneeden, a developer and partner of Preserve Communities Group. All four cited the developer’s work on affordable housing development projects in Asheville. “What we have here is a sophisticated private developer … who is interested in building affordable housing in our city,” said Mayfield, who made the motion to approve the project, known as the Family Lodge. “I see that and I want to encourage that continued investment in our community,” she said. City officials are struggling to cope with a severe lack of affordable housing. They’ve also been working to mitigate the impacts of increased tourism on local infrastructure. Vice Mayor Gwen Wisler, Councilman Brian Haynes and Councilwoman Sheneika Smith voted against the plans. They cited a general fatigue over an ongoing hotel construction boom that has resulted in the opening of 1,575 new hotel in and around Asheville, with another 500 rooms expected to come open before the end of the year. “I’m spent with hotels in this area,” Smith said, noting that City Council earlier this month approved a 103-room Residence Inn by Marriott extended-stay hotel on Biltmore Avenue, just south of the location of the Family Lodge. Sneeden’s team, which included civil engineer Chris Day of Asheville-based Civil Design Concepts, Robin Raines of Asheville’s Rowhouse Architects and Asheville attorney Gene Ellison, detailed the hotel concept. It calls for 36 hotel rooms in a new five-story building to be built between Wild Wing Cafe on Biltmore Avenue and a new seven-story luxury condo building that is under construction and is also a project of Sneeden and his Preserve Communities Group. The rooms will have small kitchens. The other 20 lodging rooms would be spread across three buildings dating to around the 1890s. The developer agreed to place the buildings under preservation easements and hope to earn tax credits for the historic preservation of the buildings. The preservation easements mean the buildings cannot be torn down, and they protect the buildings’ exterior. But the easements do not prevent interior changes or the use of the buildings, which have either been vacant or used as offices in recent years. “The houses are going to be restored back to as much historical originality as possible,” Raines said. Ellison said the project fits the city’s comprehensive plan for the area, was supported by a staff recommendation for approval and had been updated to address concerns articulated by the city’s Asheville Downtown Commission. “I think this is a great project for the South Slope,” said Ellison, referring to the nickname for the neighborhood, an area that has been red-hot for the development of new restaurants, breweries and residential projects. That was the extent of public comment. No member of the public rose to speak against the plans. Councilman Haynes, who has been increasingly vocal about his opposition to new hotel projects, quizzed Sneeden on his involvement in the luxury condo project at 145 Biltmore Ave., which is under construction, as well as the newly opened 45 Asheland Ave. condo project. Haynes said “I would prefer luxury condos to hotels” and wondered if the Family Lodge project was an attempt to circumvent relatively new city rules against the short-term rental of condo units. Sneeden said that it was not. Mayor Manheimer, who works as an attorney, used her remarks to remind everyone of the legal requirements under the city’s conditional zoning process. By state law, City Council should only be considering whether a project is consistent with the city’s comprehensive plan, whether it meets city ordinance requirements and whether it addresses an site-specific concerns. 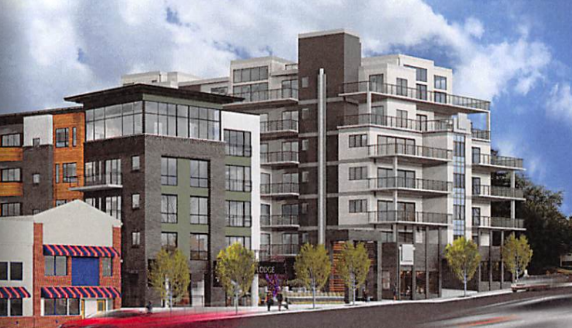 In explaining her support of the project, Manheimer reiterated what she said earlier in the month when she voted to approve the other nearby hotel on Biltmore Avenue. She remarked then that the city was struggling to deal with the pressures that increased tourism placed on the city, but that she was heartened by the Buncombe County Tourism Development Authority’s recent moves to consider changes in the way it allocates some hotel room occupancy tax to mitigate some of those pressures. “I continue to be encouraged by (the TDA’s) overtures to work with us on a log term plan to better fund the city’s needs for the people who live here as well as the people who visit,” she said. Hotel rooms are bad, luxury is bad, unaffordability, and all that – blah blah blah, yeah I know… but this one just seems like a cool project to me, the way it preserves, restores, and reuses the three houses along Biltmore. Of the recent crop of luxury hotels, this stands out as one of the the three best. The other two are the Foundry and the Grand Bohemian. Asheville has always been a tourist city and before this boom was actually way below its 1920s era count of downtown hotel rooms. Some of the bland genericboxes like Aloft, Indigo, etc – I could frankly take those or leave them – but this one seems special. Also, adding hotel rooms helps preserve existing housing, as housing, rather than short term rentals. If hotel rooms are plentiful, oversupplied even, while short term rentals are highly regulated, scarce, and risky for the owners, that will mean fewer short term rentals and therefore more of the tourists will choose hotels. I’m just sick to death of new hotels, new restaurants, and new breweries because those are the only three things anyone ever builds around here. Meanwhile, as we’re digesting our latest bolus of hotel rooms, down in Greenville they’ve announced plans for a convention center that includes two new art museums, a 60-acre park with an observation tower, and housing galore. Meanwhile, much more housing, plus several office buildings which will house jobs that do not involve kissing tourists’ asses, are also already under construction or nearing completion. I’m sick of the hype and the commodification of Asheville. There is no shortage of new and proposed hotels in Greenville right now as well. The major difference between the two cities is that Asheville has a more vocal and influential anti-growth populace than in that city. If those same developments were proposed here, everyone would be up in arms about how Asheville is losing is “uniqueness” and “soul” or my favorite hyperbolic rhetoric “Asheville is turning into Charlotte”. Greenville’s ambitions go far beyond lame attempts of maintaining a small town charm. They realized and embraced a while ago, as true visionaries, that they could successfully balance growth, maintain their character while enhancing quality of life. Oh, I know they’re building hotels down there too. In fact, there’s an expansion of an existing hotel that will be part of the convention center/art museums project. But… that project also includes the convention center and art museums. Up here, it’s nothing *but* hotels. The irony here is that by shouting down bold projects — and I agree there’s a trend toward that in Asheville — we end up with a lot of buildings, like the downtown Hilton and Hyatt, that would look right at home in Charlotte. That cheap construction and boring boxes clad in beige styrofoam cladding certainly don’t scream “Asheville” to me. Now I will give you that and completely agree with that assessment. It truly is unfortunate.